Pinterest can be used as part of an SEO strategy. If you have a website that just is not ranking high for the keywords or keyword phrases you need it to, give Pinterest a try. 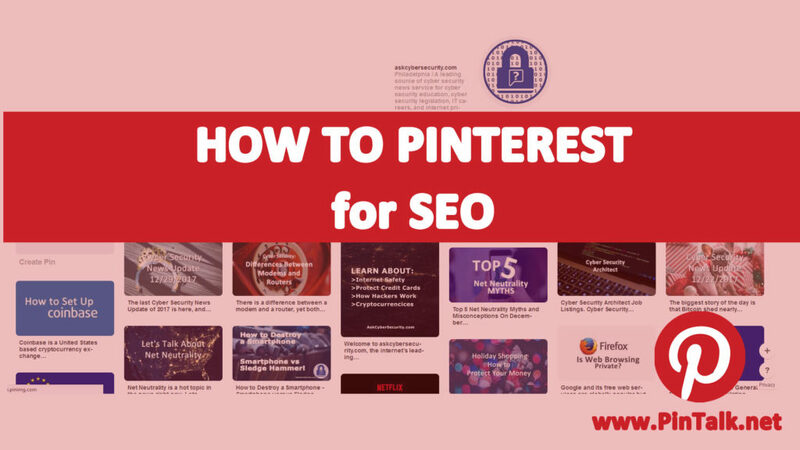 This video gives you some quick tips to start using Pinterest as part of a planned SEO strategy. Naming boards with SEO friendly names can get your Pinterest Pins found in Google.com searches. Pinterest is a highly visual social media channel. It is one of the larger channels with over 175 million monthly active users. Of those Pinterest Pinners, 75 million of them are from the United States! Pinterest is known for its shopping savvy users. They use the social media channel to save images of items they are interested in to their accounts, on “boards.” Pinterest users are shoppers with some of the best conversion rates of any social channel! In case you didn’t know it, Pinterest and Google.com are in a partnership agreement. Pinterest Pins show up in Gogle.com searches. Naming Pinterest boards after desired keywords and keyword phrases can increase the chance your Pinterest Pins will rank in a Google search. Be sure to also fill out the Pin description completely. Also, don’t forget to include a URL when uploading an image (as opposed to pinning from a website.) This is a very common mistake. If there is not URL associated with the Pin, then users will simply see a close-up view when they click on the Pinterest Pin, rather than going to your website! Not exactly a wasted effort, but probably not the website traffic drives your wanted either. How to Set Up a Pinterest Account – Part 5 – What do I pin?